A new deck can add value to your home and increase your living space without the expense of adding an additional room on your house. A place to be enjoyed many months out of the year and some places all year. It makes sense that building or updating a deck can boost the value of your home and provide a peaceful retreat. 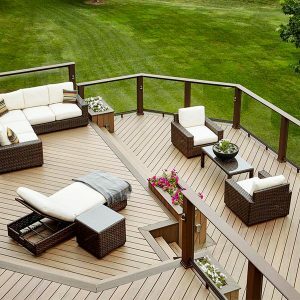 Wood decking is the overwhelming choice for most homeowners. However, Composite (Synthetic) plank decking offers good looks with less upkeep. Composites, which blend ground-up wood and plastic, have chipped away at wood’s popularity. Some even contain recycled plastic. On average homeowners spend about $7,000 to build a 200-to 500 sq ft deck, with some smaller decks costing as low as $2,000. The cost to build a deck in wood, composite or plastic is around $35 per square foot, including materials. The cost of your project will depend on factors like size, building materials, and extras to enhance functionality. AND…Don’t forget local building codes and permits. With so many materials available, it’s tough to know which will stand the test of time. Use this buying guide to consider smart options that fit your budget and help create a space that’s both relaxing and easy to care for. Some deck materials require almost no ongoing maintenance, but you’ll pay a bit more for the convenience. Less expensive materials can make a fine deck, but often require more maintenance, like regular cleaning and resealing to avoid rotting and color changes. When choosing materials for your deck project, your options fall into three main categories, each with pros and cons. Composite materials are very durable, and won’t splinter or rot. No staining or sealing required, though polyethylene and polypropylene contain real wood, so they can be stained to your desired color. These materials are available in “hollow core” which allows the running of wire for stereos, lighting, etc. Composites are available in a variety of colors and can have grain painted on to give the appearance of natural wood. Polyethylene is less durable than polypropylene or PVC. PVC will not accept stain since it is entirely synthetic. While more durable and largely maintenance-free, these materials cost more than natural wood. Dings can’t be sanded out. The space in hollow-core decking makes it more prone to deterioration over time. Composite materials trap and emit heat during hot weather, which may be a comfort issue if you live in an area with high summer temperatures. The cost of composite decking is about $35 per square foot, including moorings, railings, framework and other components. A word of warning about composite decking; it uses glue and other chemicals to hold the wood and plastic together. In the event of a fire, these substances will release toxic gases into the air. Also, unless treated with fire-retardants, composite materials can burn hotter than wood. If you just want a deck to relax on, this may not be a concern. But use caution if you plan to install a fire pit or outdoor grill on your deck. Has only been used commercially for a short time, so hard data about its longevity is currently unavailable, though early results are promising. Bamboo is a fairly new commercial decking material. While it can be hard to find long-strand bamboo dealers, it might be worth your while to look. When purchasing bamboo, be sure it comes from sustainable farms. Unscrupulous dealers may harvest from wild regions and damage natural habitats. The quality of bamboo harvested in this way cannot be guaranteed. Sustainable farms can provide at least some guarantee as to the health of the wood. With the exception of redwood, most natural woods used for decks are sustainably grown. Tight regulations and industry oversight can make the tropical woods harder to come by, but their durability is enough for some people to justify the cost. Pressure-treated wood is an attractive material for those on a budget. Of all the materials offered, however, this one merits the most scrutiny for its cons. The good news about the chemicals (which are nowhere near as dangerous as they used to be) is that you can apply a penetrating oil-based sealer every year or two to protect yourself from contact. Holds up well over the years, most come with a 40-year warranty. Due to the chemicals, insects are not attracted to it. In fact, they often avoid the area. Due to the chemicals, it is not easily disposed of. Burning this wood can release toxic gases into the air and should be handled by professionals. Due to the chemicals, people and pets should avoid walking barefoot on unsealed pressure-treated wood. Older PT decks (pre-2003) used an extremely toxic chemical called chromated copper arsenate. Arsenate, a compound that contains arsenic, is similar to rat poison. It has since been discontinued for residential use and replaced by amine copper quat and copper azole. They are as effective as arsenic-based preservatives and are considered safer because the body doesn’t absorb copper. When calculating the cost of building a deck, you have to figure in more than just the wood. A deck made from inexpensive materials may not be cost-effective when you include construction and maintenance costs. Be sure to factor in size, other construction and protection elements, taxes and insurance and all the little extras that make a deck not only usable but enjoyable! Most deck builders charge an average rate of around $35 per square foot. Materials are also purchased per square foot. If you want a large or elaborate deck, you will spend quite a bit more than for a small platform. It comes down to functionality. If you want to do more than sit on your deck, your budget will increase. There are two rules of thumb regarding the design and construction of your new deck. First, the surface should be no more than two inches below the access door. Not only does this make for a clean appearance, but it’s also the normal step-down or step-up that most people expect. Second, your deck should be no larger than the largest room in your house. This helps keep the deck proportionate to the rest of the living space. **If your design has an unusual shape or multiple levels, it will be harder to estimate the cost. A standard, rectangular deck can often be had for as little as $1,500, but custom designs can easily reach $5,000. There are many calculators available online that can give you a rough idea of what your deck will cost, and some purchased programs will even print your plan out like a blueprint. 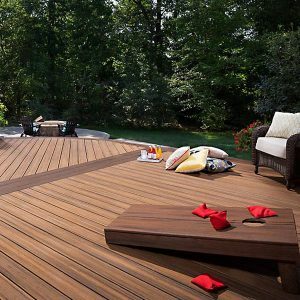 Or you can visit The Deck Store where an experienced, award-winning team knows decking inside out. Building decks in the Minneapolis – St. Paul area since the 1980s. The Deck Store can help you create complete estimates of all the Railing, Decking, or other components needed to complete your deck project. A deck is an addition to your house. This means it will add to your property value and property taxes. How much it adds depends on the total cost. The best time to look into this is during the planning stage. Check with your local assessor’s office to avoid any unpleasant surprises. You also don’t want any insurance surprises. Be sure a deck is covered by your homeowner’s policy before you commit to anything. When you hire a contractor, make sure any needed permits are obtained, and ask for a Certificate of Insurance. This covers the crew during construction. If no certificate is available, find another contractor. Also, be sure the contractor will arrange a Certificate of Occupancy. This will certify that the deck is safe for a certain number of people to occupy, just as you would with a new interior room. A deck can be as simple as a platform, but where’s the fun in that? Get creative with your special features: built-in storage for keeping kids toys out of sight, a misting system to keep you cool or even an outdoor spa or hot tub! Built-in furniture can even double as hidden storage for covers and spare cushions. Each of these features will make your space more usable. You will also want to factor in the cost of landscaping the area around the deck to tie everything together. Lighting is not only great for the ambiance; it’s also a great safety feature. While some lighting can be hard-wired, many people opt for the ease of solar lighting, which requires no special skill besides knowing where you want it. Some lights even come in colors. 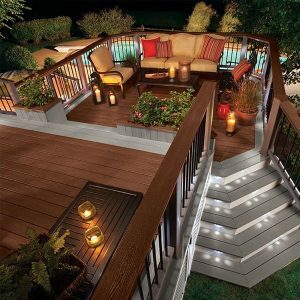 The average cost of lighting varies depending on which brand, style etc., but deck lights run from $8 to $30 each. Post lighting can cost considerably more, from $30 to over $100 apiece. Heaters are found on many decks because cool nights shouldn’t be enough to drive you inside. The most common type of heater is the post heater, but other types include wall-mount, hanging and table-top heaters that look like table lamps. The average cost is $100 to $300 depending on style and output. Misting systems are popular for decks that receive too much heat. A misting system provides a fine spray of cooling water as a barrier. If your area has hard water, you’ll have to clean the nozzles every so often, and wood fascia can be damaged by moisture if not sealed, but the impact on your water bill is about the same as watering your lawn. Misting kits can be had for as low as $25, and portable misting fans run from $100 to $150. Seating is a must. Options range from plastic patio chairs to furniture you’d be proud to have in your living room. The same goes for tables and other surfaces. For a deck that will be more than a place to watch the sunset, furniture prices start around $350 for a “chat set” consisting of four chairs and a low table, to $4000 for chairs, a sofa, some end tables, and a coffee table. Other furniture includes a bar counter (average $500), awnings ($700 to $1,000), and slipcovers ($20 to $250). Replacement cushions cost between $30 and $150. Landscaping is the icing on the cake for a well-built deck. To help protect your deck, consider using planters with caster wheels. This will make moving them easier when it comes time to do routine maintenance. Also, try to use plants that don’t need much water or require a lot of drainages. This way you can avoid damaging your deck due to overflow. Landscaping costs vary depending on what you choose and the kinds of planters you purchase. Patio Enclosure: If you find that your deck isn’t comfortable enough year-round, go the extra mile and create an enclosure or sunroom. The average screened-in porch cost ranges from $8,500 – $23,000 depending on the features and look you choose. Before you start calculating and estimating how much it will cost to build your deck, you should ask yourself how many decks you really need. It might be tempting to build a fully loaded, multi-level party platform simply because you can, but it will be costly. If what you really want is a place to sip lemonade and watch the sunset, you will have wasted quite a bit of money. On the other hand, if you have kids or expect to entertain a lot, that cozy 10-by-12-footer is going to get crowded. Experts recommend creating a mock-up. Put everything you intend to have on your deck where it’s going to go. If you are going to put a gas grill on your deck, do some research before determining its placement. The particulars vary from state to state, but a rule of thumb is to keep it at least three feet away from any wall and five feet from any overhanging structures. If using a charcoal barbecue, keep a heat resistant pad under it, and have something to set the lid on if it is removable. Otherwise, you could scorch or burn your deck. Once you’ve done a mock-up, mark it off and measure. Leave it all in position for a while, and note how much sun your location does or doesn’t get. If you get too much or not enough shade, you may want to rethink the location. By creating a mock-up and paying attention to specifics before you commit to a contractor or building plan, you’ll save yourself the cost and hassle of changing your mind once the project is underway. Once your deck project gets underway, there will be a lot of foot traffic and materials lying around. Avoid damage to your landscaping by protecting your yard with tarps, cages and other barriers. Spending a little time at the beginning of the project will help you mitigate any additional costs to fix the landscaping once your deck is complete. Remember to include the cost of routine maintenance in your project budget. If you use stain, it will need an occasional refreshing to maintain the color. Some stains are transparent and allow the wood grain to show through. This is best for wood in good condition with an attractive grain pattern. Semi-transparent stains accent the wood grain while adding a little more color. Solid stains are more like paint and are good for wood that is visibly aged and a bit distressed. The average price of stain is around $30 per gallon. Sealer is what protects your deck from the elements. To keep your deck at its best, it should be resealed every year. Before resealing, clean and pressure wash your deck to remove the old sealer. New sealer costs an average of $20 per gallon, though prices run from $10 to $40 depending on the manufacturer. 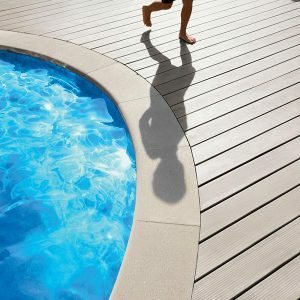 You may also want to waterproof your deck, which is not the same as sealing. Sealant penetrates into the wood’s pores and protects it from mold, pests and the accumulation of moisture. If you stop at just sealing the wood, the sealant can break down if standing water is allowed to collect. Waterproofing causes the water to bead up and easily roll off your deck. By not allowing the water to soak in, waterproofing helps your deck dry faster as well. While some people have had great luck with combination waterproofing sealers or waterproofing stains, others prefer to have a separate product for each stage. The combination products sell for between $10 and $25 per gallon, a stand-alone waterproofing agent costs around $15 per gallon. If you use separate waterproofing and stain, you will need to remove both in order to reseal, so the waterproofing will have to be reapplied as well. >After you’ve done all the estimates and come up with the perfect design, it’s time to decide if this is a job you can handle. The safest answer is “no.” While it’s possible to build a deck on your own, there are details you might not have considered. How deep do the piers have to go? What are the local requirements for stairs and railings? Which permits do you need? Do you have the right insurance coverage? Insurance is a big factor. If you build your dream deck yourself and any part of the workmanship turns out to be faulty, you may be liable for any resulting damages or injuries. In addition to construction issues, as a DIYer, you run the risk of building a deck only to have an inspector tell you to rip it all out because it isn’t up to code. By hiring a skilled and experienced contractor, you can be reasonably sure that your deck will be built properly. Uneven boards are serious tripping hazards. Even if all of the boards are level when your deck is new, they can become uneven with time and weathering, and moisture may build up on boards where the sealant has deteriorated. While this can happen over time even with a professionally installed deck, DIYers often lack the trained eye for selecting wood that is less likely to warp. Many home improvement stores get their timber from different suppliers, so the quality of the wood is hit-or-miss. A contractor usually works directly with established suppliers to get consistently high-quality cuts. Rails and stairs that are improperly supported can bend or break, even under normal wear. The use of improper fasteners is usually the cause of such failures, but sometimes fasteners can be over-tightened and cause undue stress at the fasten-point. A contractor will know what kinds of supports and fasteners are needed for stairs of different lengths and angles. Inadequate foundation support can lead to bending and bowing, or even to a catastrophic collapse of the deck. The ideal distance between support piers usually depends on the weight load the deck will be under. The piers also need to be sunk to a particular depth, which is often dependent on the depth of the frost-line. Drainage beneath the deck also requires careful attention in order to avoid rot in the support beams. With a second-story deck, you may decide to use the area beneath as another relaxation area. This could adversely affect drainage if not done properly. Other trouble spots many DIYers often forget are joints. Any place two elements come together, such as the deck platform and the exterior wall of your house, can cause trouble, as small debris builds up and traps water. For example, pine needles can build up between your deck and house and act like a sponge, trapping mold and mildew. Contractors will know what to look for and what sort of precautions, such as flashing, need to be used. Building codes can be extremely costly to the unfamiliar. You may have the most amazing deck in the world. It’s got a bar & grill, a spa, a play area, a party platform, an outdoor theater, and you built it all for under $15,000. The neighbors love it. Your friends are jealous. Even your wife admitted she was wrong about it. Unfortunately, you failed to get permits for the electrical system, the gas lines weren’t inspected, and the construction doesn’t meet code requirements. You have to rip it all out and possibly face hefty fines. A good contractor will arrange the necessary permits and inspections, so when it comes time to christen your deck with the first barbecue of the season, there will be no nasty surprises. Hiring a contractor is strongly recommended, especially if you’re building your dream deck. Although the cost of hiring a contractor can be double or triple the DIY cost, the peace of mind is worth it. As an outdoor living space, a deck requires inspections and permits. Some elements may require the services of an architect. Safe placement of gas lines, fire pits, hot-tubs and other features is something you don’t want to guess about. And all of those features need the proper support to avoid a tragedy. Therefore, your safest bet is to hire a contractor who knows how to do the job properly. Before gathering deck estimates, be wary of contractors who boast that they do things up to code. That’s contractor-speak for doing the minimum necessary to pass inspections. Look for contractors who boast about doing things above the code requirements. If possible, get references from friends or neighbors who have had a deck constructed. ** This is the best way to see a professional’s workmanship for yourself. If you have any concerns about the safety of your deck, have it inspected. A good contractor will provide you with details of what contributed to the damage and, if possible, how to avoid it in the future. How much it costs to restore or replace a deck varies as much as the original cost of a new deck. Disposal — Pressure-treated wood is not easy to dispose of due to the chemicals involved, so the cost for disposal of this material can be higher than for other products. Modifications — You might think that changing the style of your railing is minor compared to adding a level to your deck, but to a contractor, it represents more time and material. Discuss any changes to your existing deck before agreeing to an estimate. Permits — Replacing certain parts of your deck may require additional permits. Remember, you may think your deck is little more than an elaborate porch, but inspectors and assessors consider it the same as adding a room to your house. If plumbing, gas or electricity is going to be modified or installed, it will have to be inspected, and likely also permitted. Certificate of Occupancy — Because a deck is considered outdoor living space, it will have a rating for maximum occupancy. Your contractor should arrange for this certificate. Demolition — This is an extra cost for most contractors. Residential demolition averages $5 to $15 per square foot of livable area. If the wood is in good shape, some contractors will carefully remove it for low to no cost, as they can use it on other jobs. Adding a new deck is just like adding a new room. Granted, it’s a room without walls or a roof (unless you put in awnings or a pergola), but it should be approached with the same care and consideration you would use when adding an addition such as a bedroom or expanding your kitchen. With proper planning and the right deck building professionals, your new outdoor space will give you and your family enjoyment for many years to come! Get in touch with The Deck Store today! Copyright © 2019 The Deck and Door Co.